An idyllic island paradise where you can escape the stress of modern living and relax amongst golden sandy beaches, abundant coral reefs, swaying coconut palms and azure seas. With a total of 45 bures, Malolo offers four different accomodation categories including Ocean View Bures, Deluxe Ocean View Bures, Family Bures and Tadra Beach Bures for couples only. All Oceanview and Deluxe Oceanview Bures have a king bed and two single beds, ideal for a family of four or a couple. The Family Bures can sleep up to 7 people, whilst the Tadra Bures have a king bed and two daybeds. Perfect for families and couples alike, at Malolo, you can fill your day with a myriad of activities or simply unwind and do nothing at all. Malolo is an intimate, rustic resort. It’s about a bure near the beach, surrounded by the world’s friendliest people with a living and authentic culture. Experience the true hospitality of the Fijians at this 100% local Fijian family owned resort. Beach Bar: Open for lunch and dinner, enjoy casual beachside dining on the water’s edge with stunning sunset views over the reef. The popular all day snack menu and evening cocktail hour is accompanied by the sounds of the Malolo Serenaders. The Terrace Restaurant: Open for breakfast, lunch and dinner enjoy the delightful menu (including a kids menu) as you look out over the resorts swimming pools and lush gardens. 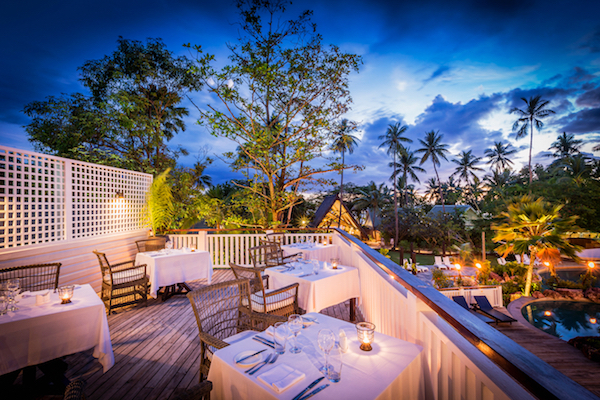 Tree Tops Restaurant: Set high in the coconut trees overlooking the resort this terrace restaurant enjoys a relaxed and casual atmosphere. Treetops is an adults only venue only permitting guests 13 years and over to dine. Open daily for breakfast and dinner. The Pool Bar for adults only, is the perfect place to enjoy an ice cold beer, glass of wine or tropical cocktail while cooling off in the adults pool or relaxing in the Jacuzzi. This complementary supervised kids club is for ages 4-12 years, set into the hillside under that shade of a mango tree. The smiling staff provide fun and games for the children including watermelon cracking competitions, three-legged races, shell collecting competitions, crab hunting, limbo dancing, balloon dancing, fish feeding, painting and lots more! 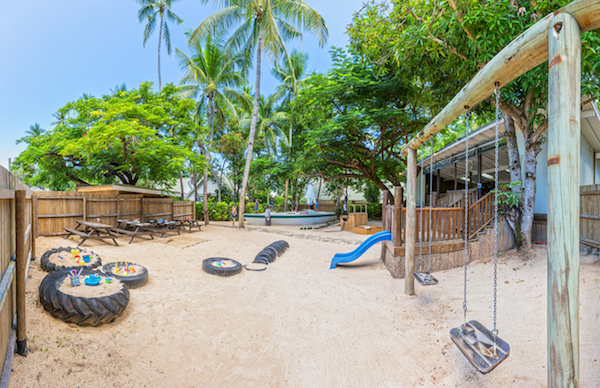 Please Note – Tia’s Treehouse is not equipped to cater for children under 4 years and a private babysitting service can be arranged at the resort for F$10 per hour. Khail’s Club: the older kids 13-18 years will love this cool place to hang, enjoying table tennis, games, satellite TV and free WiFi.